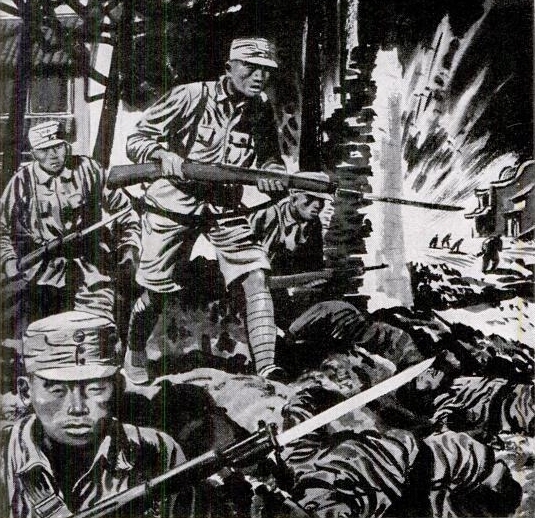 Today, American airmen are ferrying a greater tonnage of military supplies to hard-pressed China than was ever carried over the tortuous Burma Road. They're flying it over "The Hump" - the towering Himalayas between India and China. It's the most treacherous 500-mile air route in the world. But the freight goes through! The first leg of the journey is over the steaming, foggy Assam jungles. Because there are no emergency landing fields, some of the planes have crashed. But most of the men who bail out eventually plod their way to safety. 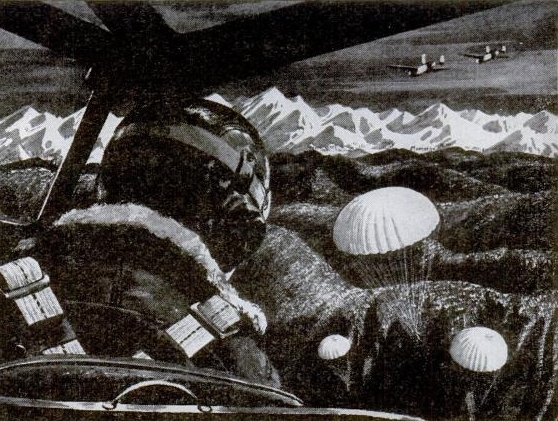 Some of them owe their lives to rescue pilots, who have dropped instructions and supplies by parachute. Day and night, the heavily loaded Liberator Express transport planes streak toward "The Hump." Shuttling across a tumbled mass of uncharted mountains, they dodge peaks that rise 20,000 feet. Icing is an ever-present hazard. 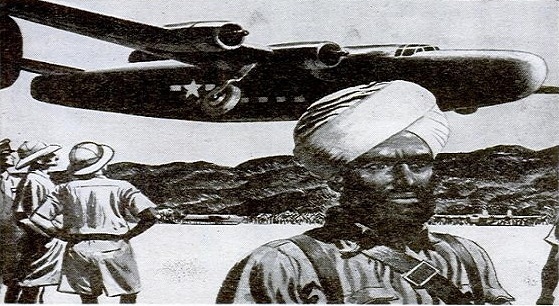 Flying unarmed, the cargo planes are often attacked by Jap fighter planes. Still the freight goes through! The slender aerial life line over "The Hump" is now the only channel by which Allied war equipment gets into China. Around the clock, in monsoon season and out, our flyers carry a constant stream of gasoline, bombs, jeeps, ammunition, artillery, small arms, clothing, aircraft engines and spare parts. Many of our India-China flyers have been awarded decorations - and they've earned them! No one pretends that the supplies being flown in are sufficient to fully equip the Chinese. But the same ingenuity and courage that can conquer the lofty Himalayas will eventually open up new channels of transportation so that today's trickle of supplies will swell to an avalanche. After the war, when all forms of transportation must work together to rebuild the peacetime world, the plane will continue to play its part, along with the truck, the train, and the ship. But the plane will have a second, and even greater, responsibility to fulfill: that of helping to enforce the peace in this 60-hour-wide world. In short, a permanent postwar Air Force can be one of America's soundest investments in the interests of a lasting peace. Preview of the future - Last year, 6% of the dollar volume of all imports to the U.S. came by air - a total of 4,000,000 pounds. 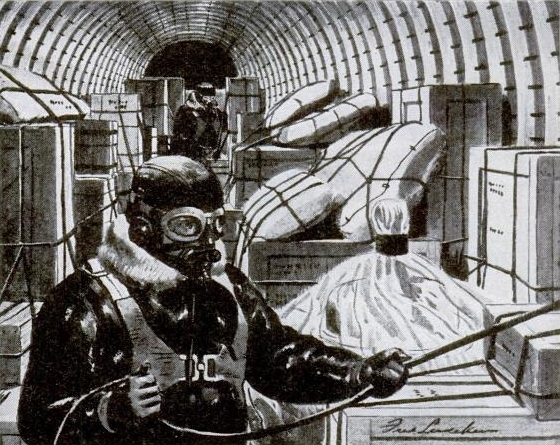 Many of the air cargoes included mica, quartz crystals, industrial diamonds, and rare drugs, without which the production of vital war materials could not have continued. Saving American lives - Litters for 8 wounded men can be fitted into the bomb bay of a Liberator bomber. The Army has speeded the recovery of several hundred thousand casualties by flying them out from combat areas to hospitals. 9 tons per month - The Air Service Command reports that for every Air Force pilot based overseas, it sends out an average of 9 tons of aviation supplies monthly. This does not include food and other items which are handled by the Quartermaster Corps. An airline is born - In order to expedite the flow of military personnel and equipment to the South Pacific, Consolidated Vultee operates a daily air-transport service known as Consairway. A Liberator Express recently chalked up Consairway's 1000th transpacific flight. 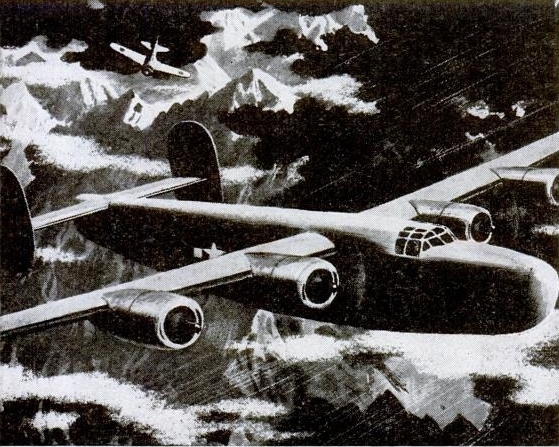 Consolidated Vultee is the largest builder of airplanes in the world. 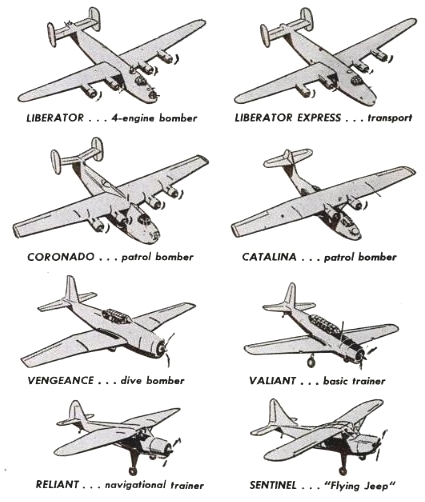 From "Flying Jeeps" to Leviathans of the air - The planes shown below were all designed and developed by Consolidated Vultee. 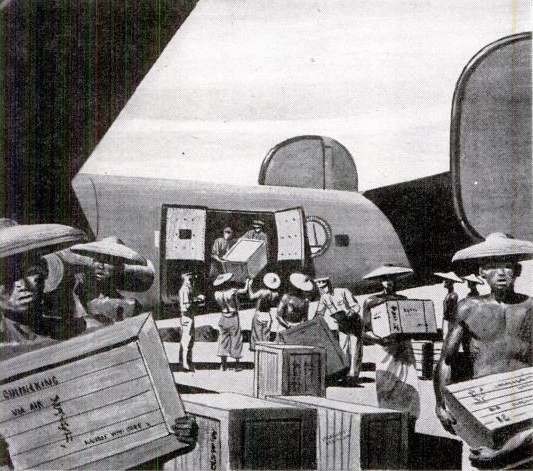 When peace comes, the company will be in a position to provide the postwar equivalent of such planes, from small, privately owned "air flivvers" to huge, transoceanic cargo-and-passenger planes. Advertisement adapted by Carl W. Weidenburner from the June 5, 1944 issue of LIFE magazine. The image of the C-87 shown on the introduction page was not a part of the original advertisement.